This post is sponsored by TropiClean and the BlogPaws Professional Pet Blogger Network. I am being compensated for helping spread the word about TropiClean Fresh Breath Drops, but Budget Earth only shares information we feel is relevant to our readers. TropiClean is not responsible for the content of this article. As some of you may remember, we have been having an issue with ‘fish breath’ in our household. With Ivi’s turkey allergy, we have to avoid things that are just labeled as ‘poultry’ leading to us having her on fish-based puppy food and treats. While she doesn’t mind the change at all, mom and dad aren’t too thrilled that her puppy breath was replaced with dog breath that smells strongly of fish. Luckily, we have been trying out the perfect solution in our girls’ fountain – TropiClean® Fresh Breath Drops™! 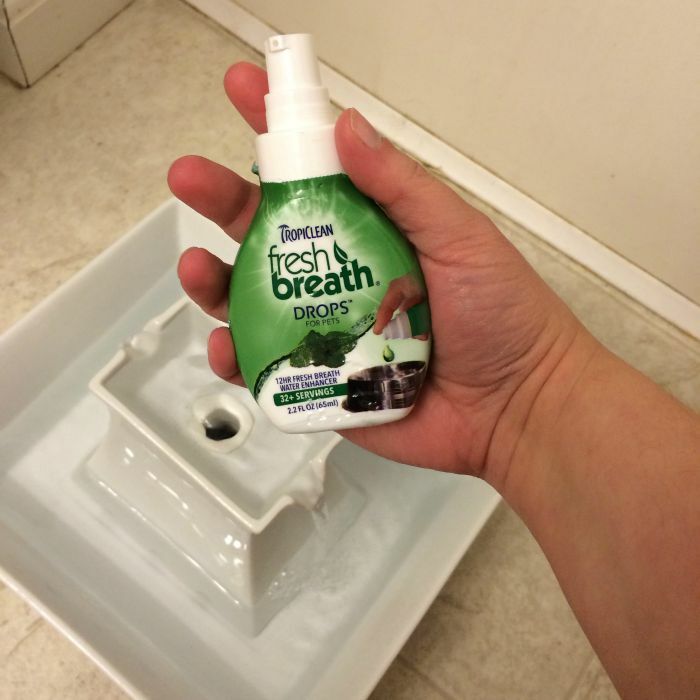 TropiClean Fresh Breath Drops: What is It? Looking for a way to fight back against bad dog breath and improve your dog’s oral health? If so, we think you will love TropiClean Fresh Breath Drops. For those who have never heard of TropiClean, they make a variety of natural pet products, including a natural dog breath remedy made from safe, all natural ingredients that are perfect for both dogs and cats. This natural dog breath remedy is very easy to use – you just put three pumps for every 16 oz of water each day to get the best results. Not only does it leave your dog’s breath smelling amazing all day, but helps with their overall oral health as well! In the end, your dog has amazing breath that leads to even more cuddles. Who knew taking care of your dog’s bad dog breath could be so easy!? So far, we are pretty happy with TropiClean Fresh Breath Drops. While Ivi and Reya don’t normally have very bad breath, we are excited that they no longer have ‘fish breath’ while using these fresh breath drops. While I love the nice minty breath, the best part is that it also helps with Ivi and Reya’s overall dental health. Just add three pumps to every 16 oz of water and you don’t have to worry about brushing your dog’s teeth! While we do both, it is nice having extra protection, especially since dog dental health is something we take very seriously in our household. Who knew that this easy natural dog breath remedy could be so effective and make cuddling your dog even better? Ready to fight back against bad dog breath in your household? You can buy these dog freash breath drops at Petco, Pet Supermarket, Pet Club, and other independent retailers near you using their store locator. We are certain you will like these drops just as much as us! Also, don’t forget to check below to learn how you can win a bottle of these drops for your own dogs! Want to learn more? Check out TropiClean on social media! Want the chance to win some of these awesome dog breath drops for your own dogs? We are excited to be working with TropiClean and BlogPaws on this fantastic giveaway! 10 very lucky readers will win a bottle of TropiClean Fresh Breath Drops for their own dog, making it even easier to make bad dog breath a thing of the past! To enter, make sure to read all the rules below and then enter through the Rafflecopter! 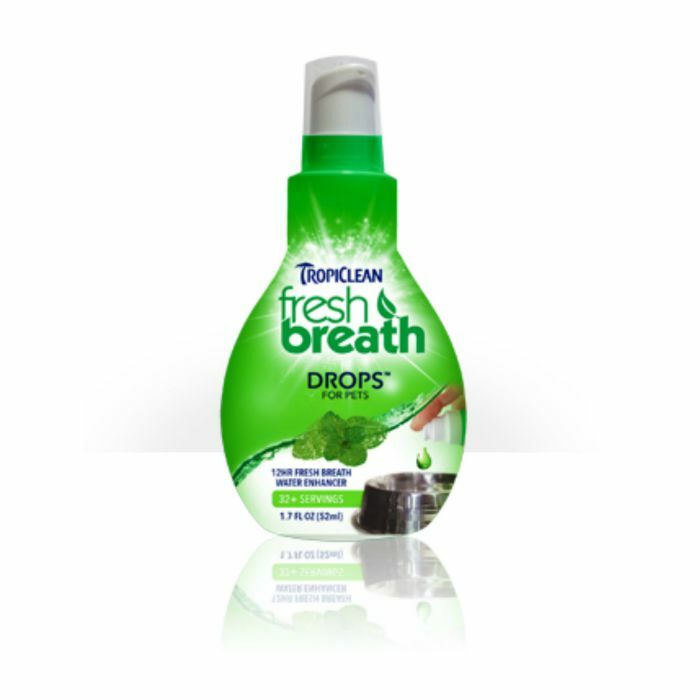 Ten lucky reader will win a bottle of TropiClean Fresh Breath Drops. Sweepstakes ends October 9th at 11:59pm ET. I know a friend whose dog needs that. I’ll have to get this for my dog. Thank you for posting this. This would be great for my friends dog! These seem like they’d be great for my pup. Yes, we get his teeth cleaned, but he’s older now and anything that will help with his oral health is a good thing. Fresh breath would be nifty too. Love the ease of use. Some products it is just impossible to administer the treatment in their mouths. I have never heard of this before but I know bad dog breath is a big problem for many. I will be passing this info along to family and friends. I know they will be surprised to find out about it. Thank you for sharing! This sure sounds like a great product to have if you have a dog. Their breath can be pretty bad at times. I never considered dog breath to be a nuisance, I just thought it’s a natural thing. Also I had never heard about TropiClean. I’m pretty sure I won’t find these drops here where I live, but maybe I can find similar products for our dogs. Our dogs usually don’t have really bad breath but some of these fish puppy foods the vet is having us try are a bit scary with the fishy smell. More than anything, I miss that wonderful puppy breath. While this won’t replace that, it is so much better than dead fish! I think my Sorcha definitely need this because she always has dog breath. Thank you for the review. Don`t know if you really need this, but my dog Kimis breath isn`t so bad. I would give them to my son for his dog. He needs them. I would love to try this for one of the dogs I baby sit for, his breath sure could use something loll,, I think its a lot of the treats his owner gives him or something ,. My son’s dog definitely needs this. I’m going to mention your review here and let him take it from there. Thanks for the review. I’m excited to know that the drops worked in your fountain. I was worried that ours would filter them out, so we just used a standard bowl. I’ll have to give it a try! i have not used this product by tropic clean but have used the water additive before. i have also used some of the cleaning products, as well for cleaning doggy messes. This would be great for my cousin dog! not sure what to comment here.. I have to get this for my little doggie! I sooo miss the puppy breath, but I guess since she’s not a baby anymore and sometimes her breath just stinks, I guess this would be a great product to try. Interesting, I’ll have to check these drops out. My dog really needs this. I give my dogs parsley for their breath and it helps to soothe their stomach. My cats like it too. Oh my goodness. I must try this for my pup. I do not have a dog. But if I did I would definitely purchase this product. thats nice for anyone that has dog! Not sure how these work. I went and looked at the ingredience and the only active one I can see is green tea extract, the other stuff is just added preservatives etc. Not sure I could pass it off to my doggie, she’s very smart. I want to check out TropiClean Fresh Breath Drops because my German shepherd mix has awful breath. He’s an old dog, and can’t have much more done to his teeth. My dog loves to pant but has terrible breath! I wonder if he would like these. He did not like the chew bones that I bought him that were supposed to freshen his breath. This sounds like a great product! I have an older chihuahua and his breath is just….awful. He’s a cuddler and I love him to death, but sometimes his breath is so bad I have to get up and walk away lol! Poor guy looks befuddled everytime, but something like this will allow him to cuddle with the family without us cringing. We don’t have pets right now (renting, lol.) But I know a few family doggies that could use this! Sounds easy to use would like to try on my dog! I inherited my dog from my daughter who couldn’t have him in the apartment she now has and he is such a sweet fellow. I just love him until he opens his mouth. His breath is terrible. He is so cute, sweet, loving and all the wonderful things a fur baby can be but my grandchildren even comment on how bad his breath is. But he’s still cute. I want to try this out because our dogs breath is really bad and it would be nice to have it fresh and minty! need to get this for my dog, i hate it when he wants to lick me in the face and his breath stinks….. Need to try for my dog his breath is fairly smelly. I love that this product works for both dogs & cats. Cat’s can have stinky breath too and I love finding a product that is versatile enough to be used on cats & dogs….having good oral health is important for both! Thanks for sharing! We live in a nursing home and Hazel goes around to all the residents. It is important that she feels and smells clean. Her breathe is terrible. We had her teeth cleaned but it didn’t help. We would love to win since we are on a very tight budget. I would love to try this, we brush our little doggie’s teeth and he chews dental sticks, but still has a problem. He goes everywhere with us and I hate he panting and getting hit with his breath. Thanks for sharing this product with us. My older dog could sure use this stuff. His breath is rotten!! He has periodontal disease poor little guy. My dog Gavan’s breath doesn’t typically smell, but this would be great for those times where it does get a little stinky. Plus, I like that it will help with his overall dental health. While tooth brushing is great for keeping those canine teeth sparkling clean, truth be known, sometimes dogs don’t appreciate all you (and they) are going through to achieve that dental health. 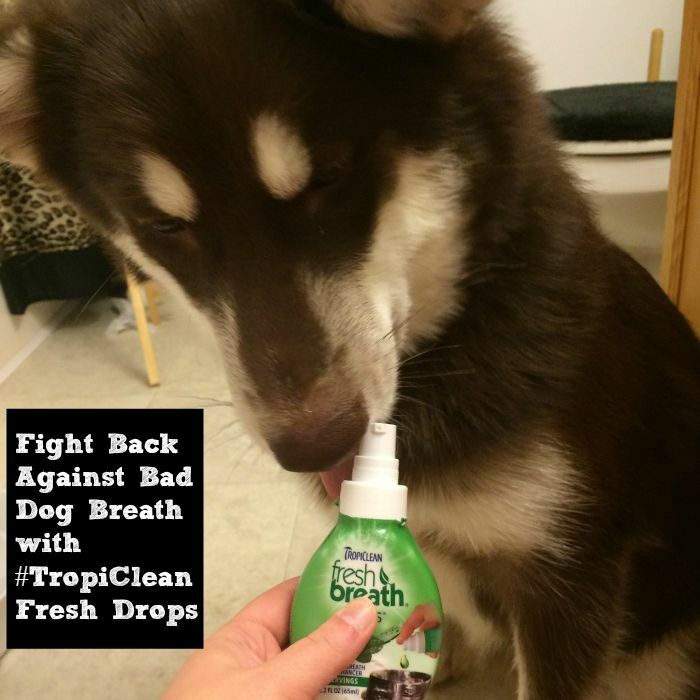 The added protection of TropiClean Fresh Breath Drops would be great, with freshening up of doggy breath a welcome result that is easily administered. Great product! Well this is just awesome! Wish somebody had of come up with it sooner! Thanks! Good idea! I wonder if there`s a product like this for cats, too? I just don’t understand why my dog’s breath smells like fish when she doesn’t eat fish. I would love to smell minty fresh breath on my face instead of rotten fish. I definitely want to try this product. My dog Snoop could really use these! I don’t have a dog; I have a cat. He has the worst breath of any cat I’ve ever had. I would love it if this would work for cats. I don’t think my dog’s breath smells bad, though I’ve never really thought about it until now. I suppose this might be good to keep on hand for those smelly breath days though! Like your beautiful baby, my baby suffers from poultry allergies too. She would get many more kisses is her breath smelled better. I of course would kiss her no matter what her breath smelled like, but the first thing the kids say is “eww her breath stinks”. I love that this offers added benefits besides fresh breath and that it is available in local stores. I will definitely be checking this out so thank you. My dog and I both need this! I need to tell my Momma about these! Her doggie has stinky breath, haha, also that water bowl you have is absolutely amazing and i think i now need one for our cats! I will pass this on to our son he has a little dog. have to get this for my dogs..Their breath is horrible. This sounds like an awesome product for puppy breath.I will have to check it out. I have four dogs and three cats, none of who like getting their teeth brushed. I give my dogs dental treats, which help, but don’t clean all surfaces of their teeth. I’ve tried the TropiClean gel and would live to try the water additive. I think would really help. I havent triedd this product noe heard of it. I think if my dogs breath got really bad I would have a dental check. I like the idea of this though. Sounds like a good product. No dogs in my life right now. I couldn’t live without this!! My dogs hate to have their teeth brushed and I couldn’t actually believe dogs could have such bad breath, but I now know! This has made such a difference as now I don’t mind kissing my fur babies. Very interesting, we have to check these drops out for my sisters pub. I didn’t know there were breath drops for dogs. I must have some. My little dog has bad breath that would knock over a grizzly bear. I don’t know what he gets into outside but it really causes an awful stench. I know someone who has a dog and her dog has bad breath; Ill definitely let her know about this so she can try it. Thanks for posting and for having the giveaway! Wow I’ve heard about pet tooth brushing but not this. What I need is one for cats! Looks like a good product. May try it! I brush my dogs’ teeth each Sunday, but I would love to use the drop between brushings. I need this for ricky and lucy ! I love that these are all natural and effective!! 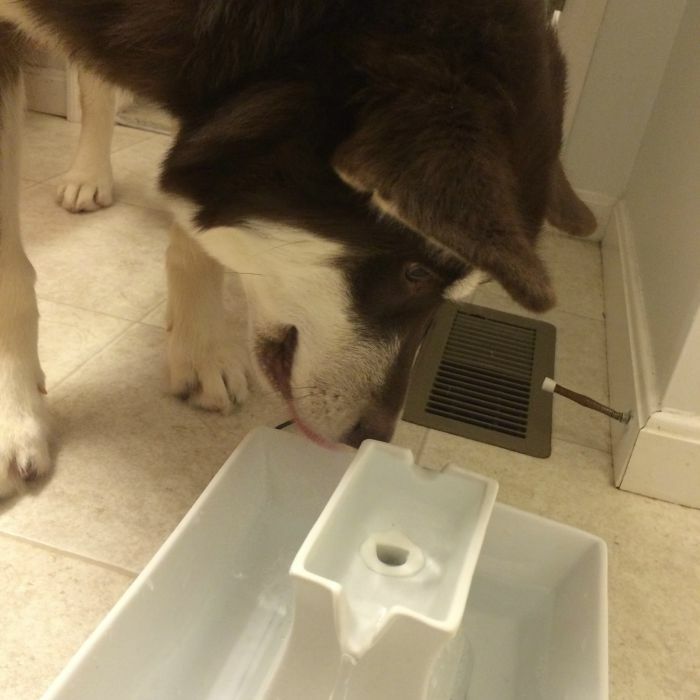 Did your dog have any issues with drinking the water when you first put them in?? What a great productTT I like that it also is great for their dental health! This seems like a reputable treat worthy of a fabulous loving pet dog. I would go for it!